Would you believe that more than 90% of building owners don’t know about their roofs? It is kind of interesting to note that while property managers hate leaky roofs, they are less likely to spend money on roofing system services. And when it comes to choosing a roofing product to replace an old one or install for their new business, all they are concerned about is the price. There are many factors to consider before if you’re trying to decide on a roofing material. Such factors will include aesthetic appearance, expected lifespan, ability to save energy, fire safety, and environmental friendliness. Quite often, building owners also struggle with finding the right roofing system services to perform the installation. We’ve written this article because we know that there is a lot of conflicting advice about flat roofing options. To be specific, we refer to TPO and EPDM. We are aware that many building owners have little to no clue about the difference between these flat roofs. Both TPO and EPDM are excellent options. Your decision as to which material is best for you all depends on your needs. Here’s a quick resource if you want to learn about these flat roofing materials and decide if they are right for you. 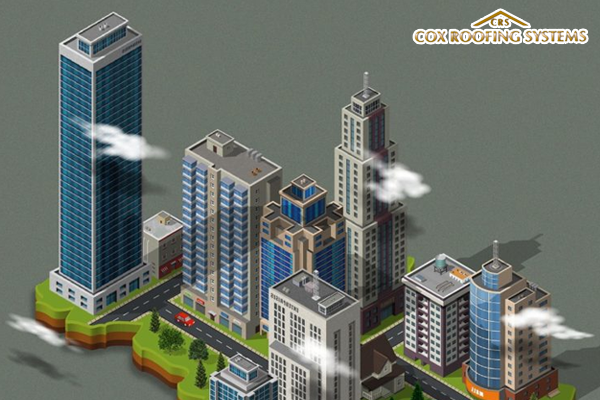 Cox Roofing Systems is a trusted TPO and EPDM service provider in Brampton, ON. Why are flat roofs perfect for buildings? Before we learn the benefits and differences between TPO and EPDM roofs, first let’s dive into why flat roofs are excellent choices for commercial buildings. 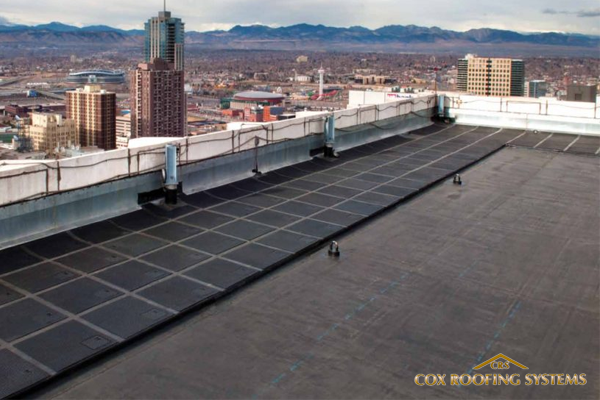 Flat roofs were designed especially for commercial buildings because they provide convenience. Roofing system services can easily install them. Another advantage is that you’ll be able to place your HVAC units on a flat roof rather than in areas where people conduct their activities. Now let’s talk about maintenance costs. Building owners who want to save can do so because it’s easier to detect leaks and other roofing issues. This makes commercial roofing maintenance hassle-free and faster to complete. Since not all the space of your flat roof will be occupied with equipment, you can utilize it for a rooftop garden or a space for relaxation for employees. Among the different types of flat roofs, single-ply membranes (TPO and EPDM) exhibit great benefits. What qualities matter to you in a roofing system? Is it better comfort? Longevity? To clarify your decision here is a guide that compares TPO and EPDM materials. Ethylene propylene diene monomer or EPDM is basically made from synthetic rubber. In terms of this material’s history in the roofing industry, it has been around between 1955 and 1965. Therefore, EPDM is older and has a more established track record than TPO. One can easily identify EPDM because of its characteristic black color. Nowadays, more and more sources claim that black roofs are no longer a good thing. White roofing options have become popular and in fact, the market and local business owners promote their use. But the good news is that there are already white-colored EPDM roofs. This may lead one to wonder what the difference between a white and black EPDM roof is. Black EPDM roofs have added carbon black. This is responsible for converting the sun’s UV rays into heat. This makes the black EPDM option excellent for climates that are colder – in northern zones. White EPDM roofs are white because of titanium dioxide. This white pigment reflects the rays of the sun thereby protecting your roof from radiation. White EPDM helps decrease cooling costs. Southern warmer areas can benefit from white EPDM. How long does an EPDM roof typically last? When properly installed by the credible EPDM services Brampton and regularly inspected, it will last more than 25 years. The lifespan of this roof can even go as long as 50 years. Among single-ply roofing membranes, EPDM roofs are the most economical choice. According to Roofingcalc.com, this material costs about $6,000-$9,000 for a 1,500-square feet flat roof. But take note that this price varies depending on other factors. These factors may include material thickness, removal of your existing roof and roofing penetrations. You’ll be surprised to know EPDM’s capacity to resist or withstand different elements and wear and tear. Below are the ways EPDM remains to be durable no matter the place and time of the year. Hail storms cause damage to property. 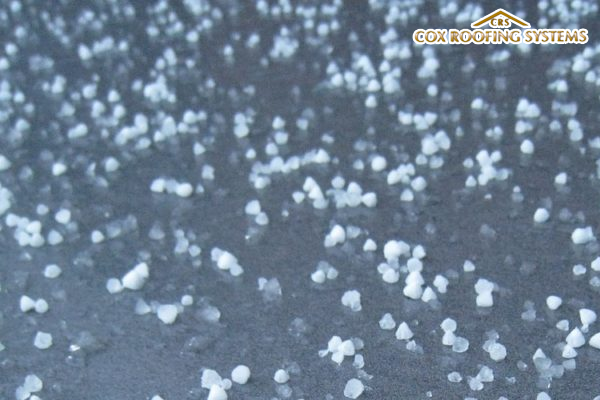 Because of that, hail resistant roofing systems are sought after by property owners across the United States. EPDM is known to be exceptionally resistant to hail. As an internationally used roofing material, EPDM is installed in both warm and cold regions. During laboratory testing, EPDM is subjected to temperatures of 240 F for a month. The material retains its flexibility even in places where the days are hot and nights are very cold. EPDM is a material that can be walked on by personnel who need to access your roof for maintenance. However, if frequent foot traffic is expected, it’s recommended that an additional material is laid over the EPDM material to protect it. Also, choose EPDM services in Brampton that install products from trusted manufacturers like Firestone. As we have mentioned earlier, you can choose a black or white EPDM. No matter where you live in, you can save on heating and cooling energy bills. The black EPDM absorbs heat which makes it the perfect choice for cold places. On the other hand, white EPDM has a reflectivity of 80%. You and your tenants will stay comfortable and work productively even during summer months. In the roofing industry, EPDM is one of the environmentally responsible materials. Not only does it require you to use less energy for heating and cooling, the material has a very low life-cycle cost. Rather than dumping EPDM roofs in landfills, roofing system services will recycle them. 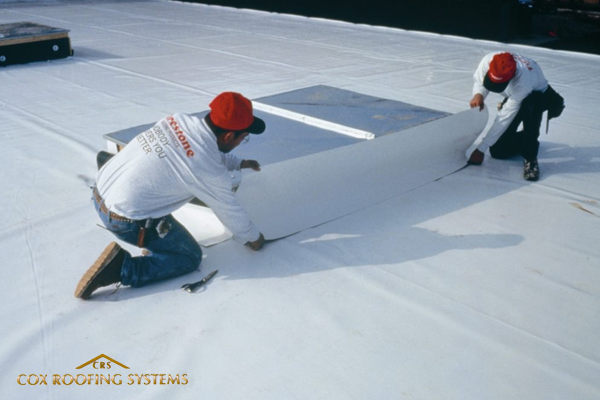 Thermoplastic polyolefin or TPO roofing was introduced in the 1990s. Despite its recent adoption, it has grown in popularity because of its huge advantage in energy efficiency. Colors typically come in white or gray. 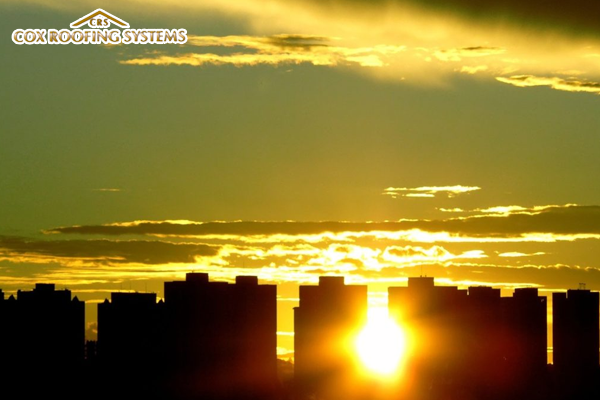 Both are equally important in reflecting sunlight so your choice depends on your aesthetic preference for your building. Roofing system services will install TPO by using plates to secure the material or fully adhere it. The latter is most applicable to roofs with irregular surfaces. The life expectancy of a TPO roof can range between 22-30 years or more. Do remember that many factors can change this – your climate and how your roof is installed. While TPO is a fast-growing material in the roofing industry, invest in a contractor that offers products from trusted brand names. With this, you can be sure that you get a roofing that will last for many years. Here at Cox Roofing, we install TPO only from Firestone. When compared to EPDM, TPO roofing will cost you more. You can expect to pay at least $8,800 for both material and installation for the size of 1,600 square feet. The price does not include the roof tear off if you were to replace an existing roof. In the process of creating a TPO roof, filler materials like carbon filler and fiberglass are included to produce a strong product. TPO roofs remain strong throughout their lifespan because they do not absorb chemicals. So if your property uses hazardous often, this single-ply roofing is less likely to deteriorate. And because this membrane does not absorb ultraviolet light, it reduces your building’s energy consumption. A cool roof in the form of TPO creates an environment that boosts creativity among workers. So if you are thinking of installing a new roof for your business, you won’t go wrong with TPO. Most people perceive singly-ply roofing systems to be susceptible to punctures. TPO is one material that has an excellent performance as it resists impact and punctures caused by a falling object. However, take extra care by leaving out sharp objects when going up your roof. The thicker the TPO roofing material, the stronger it is. Another reason to use a TPO roof is its compatibility with solar panels and green roofs. If you want to power your building with clean energy, combine TPO and solar PV. Both work together to further reduce your electricity bills. To serve as a rainwater buffer and reduce indoor temperature, you can grow a green roof over TPO. A green roof also increases the efficiency of solar panels if in case you want to use them together. So have you chosen which commercial roof to use for your business? There are several TPO and EPDM services Brampton but not all of them may give you the kind of quality you expect. Here’s a guide on how to select a roofer in Brampton. We help business owners and property owners benefit from long-lasting, durable, and competitively priced single-ply roofing systems. Cox Roofing Systems as a TPO and EPDM service provider follow the best practices in roofing installations and offer long warranties.